In Harry Turtledove's mesmerizing alternate history of World War II, the choices of men and fate have changed history. Now it is the winter of 1941. As the Germans, with England and France on their side, slam deep into Russia, Stalin's terrible machine fights for its life. But the agreements of world leaders do not touch the hearts of soldiers. The war between Germany and Russia is rocked by men with the courage to aim their guns in a new direction. England is the first to be shaken. Following the suspicious death of Winston Churchill, with his staunch anti-Nazi views, a small cabal begins to imagine the unthinkable in a nation long famous for respecting the rule of law. With civil liberties hanging by a thread, a conspiracy forms against the powers that be. What will this daring plan mean for the European war as a whole? Meanwhile, in America, a woman who has met Hitler face-to-face urges her countrymen to wake up to his evil. For the time being, the United States is fighting only Japan-and the war is not going as well as Washington would like. Can Roosevelt keep his grip on the country's imagination? Coup d'Etat captures how war makes for the strangest of bedfellows. A freethinking Frenchman fights side by side with racist Nazis. A Czech finds himself on the dusty front lines of the Spanish Civil War, gunning for Germany's Nationalist allies. A German bomber pilot courts a half-Polish, half-Jewish beauty in Bialystock. And the Jews in Germany, though trapped under Hitler's fist, are as yet protected by his fear of looking bad before the world-and by an outspoken Catholic bishop. 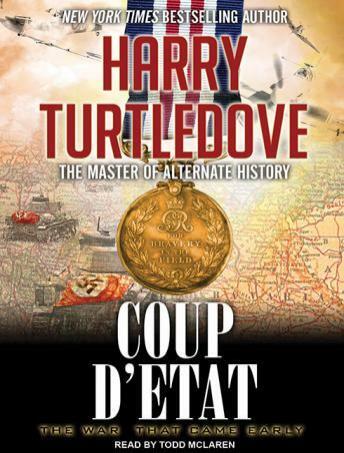 With his spectacular command of character, coincidence, and military and political strategies, Harry Turtledove continues a passionate, unmatched saga of a World War II composed of different enemies, different allies-and hurtling toward a horrific moment. For a diabolical new weapon is about to be unleashed, not by the United States, but by Japan, in a tactic that will shock the world.